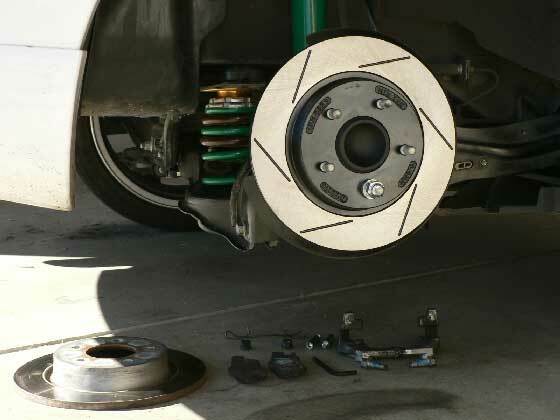 The following is a step by step guide to replacing the rear rear rotors & brake pads on a 2.3L Mazda3 or Mazdaspeed3. 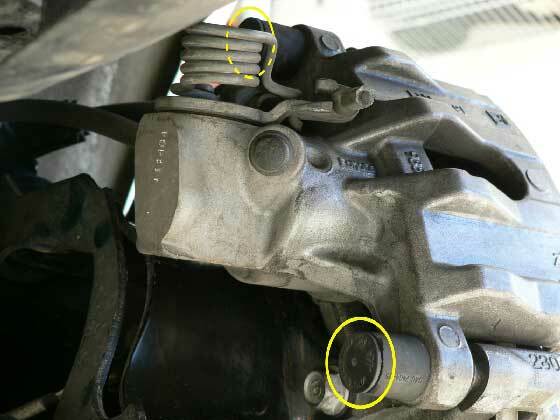 Note that both the 2.0L Mazda3 uses different parts than those shown here, so while these instructions can be used as a general guide, things like torque specs or other details specific to this car may not apply. Rear Caliper Pins: 19-22 ft-lbs. Rear Caliper Bracket 44-56 ft-lbs. If you are only replacing the pads and rotors, you will not normally have to bleed the system unless you've found your pedal feel to be mushy and suspect there is air in the lines. If you are replacing the lines though, or otherwise opening any parts of the system which may let in air (this does not include removing the reservoir cap) then you will have to bleed the lines to purge any air. Generic instructions for doing so can be found here. Jack up car and remove wheel. Using a flat-head screwdriver pop off the spring clip. The spring clip will pop/fly off, so beware. Find the two plastic dust caps that are just snapped-on the back of the caliper and remove them. Using the 7mm allen/hex key remove the caliper bolt/pin. 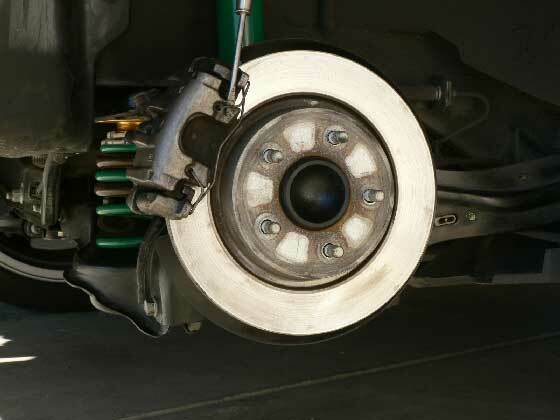 Slide off the caliper and place it somewhere as to not put any excessive strain on the brake line. In my case, I just gently wedged it between the shock and a nearby strip of flanged sheet metal in the wheelwell. 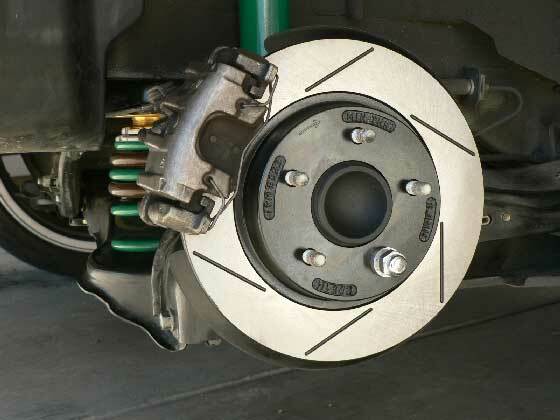 If you are swapping brake pads, the pad closest to you is just held by the caliper mounting bracket. The other pad is clipped to the caliper piston. 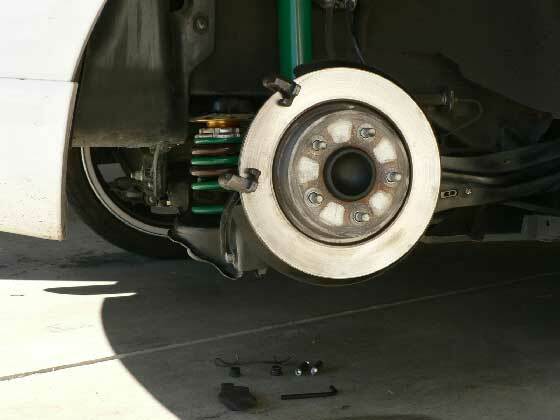 Note that you can skip the next step if you are not replacing the rotors. 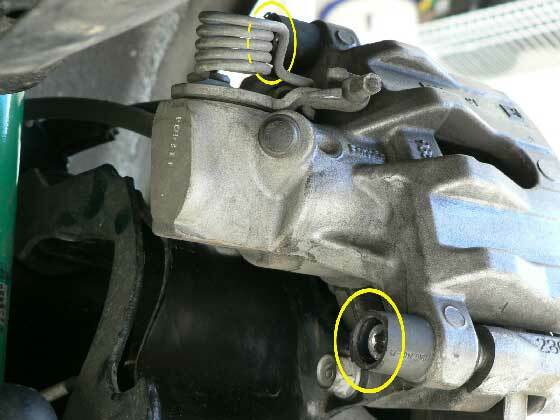 The caliper mount bracket does not need to be removed to change the pads. 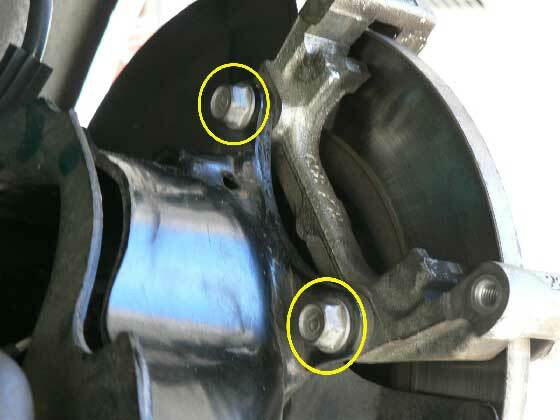 To remove the caliper mount bracket, locate the two bolts on the back of the rear upright. Using a ratchet, 14mm socket, and a breaker bar remove the two bolts. The rotor should now be free, so just slide off the stock rotor from the hub/upright. If the rotor doesn't come off easily, it is probably just rusted on. Using a mallet, just tap the along the circumference of the center part of the rotor to jar the rotor free from the hub. Slide on the new rotor, and hold it in place using a spacer and a lugnut. Holding it on like this isn't critical, but is convenient if you can do it. Reinstall the caliper mount bracket to the upright. Be sure to apply some blue loctite on the bolts. Install the brake pad. Simply place the outer pad on the caliper mount bracket. The inner pad needs to be slid into place on the piston. Note the flange on the piston and the clips on the back of the pad. 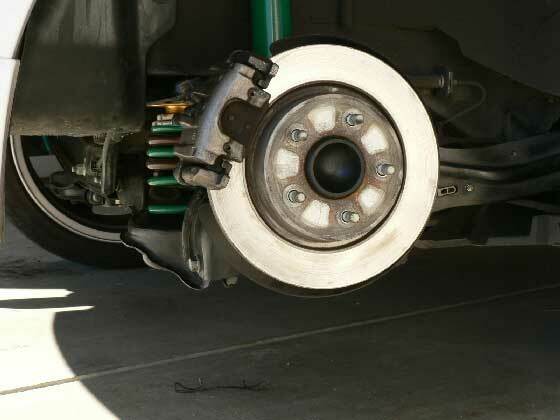 Slide the caliper over the outer brake pad and rotor. 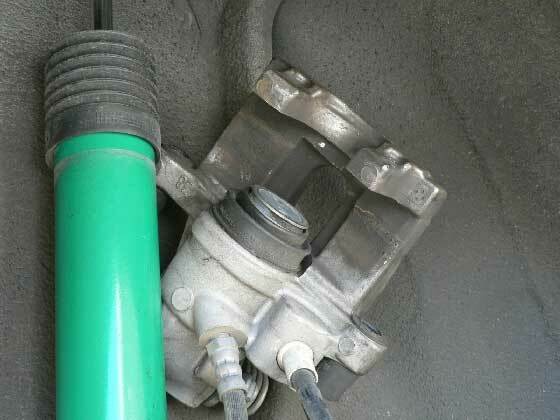 If you can't slide the caliper on, you may have compress the piston. To do this you will have to either get a special brake tool from and auto parts store, or simply use needle-nose pliers to rotate and compress the piston. On the piston you will see two circular indentions. Place the tips of the pliers in the indentions and rotate the piston clockwise while applying inward pressure to compress it back into the caliper. As with the front, be sure to first take the lid off the fluid reservoir and watch to ensure it doesn't overflow while you compress the piston. Note from Wild Weasel: I've noticed that there is a lot of commentary in the forums about people having difficulty compressing the rear pistons. I want to be very clear about this. If you haven't done rear calipers before and are not familiar with how they work, DO NOT ATTEMPT THIS with needlenose pliars. I know it can be done and have done it myself several times, but it will almost certainly be a very frustrating endeavour. If you don't own a rear caliper compressor tool, go out and buy or rent one. Many auto parts places lend them out for free. The piston has to be pressed and rotated back in. It doesn't push straight in and it doesn't screw in. The tool will press and turn at the same time, and make this job very easy. Clean, lube & reinstall the two caliper bolts/pins. Reinstall the dust caps and spring clip. Finally, remove the lugnut and spacer that you used to hold the rotor in place. Note from Wild Weasel: When replacing the rear pads on my own car (after over 100k km's) I had issues with the bottom sliders on both calipers. For some reason, it was only the lower ones. 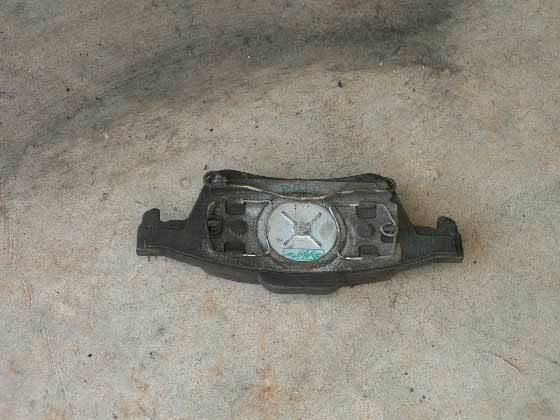 The caliper itself had corroded around the rubber sleeves so the sliders were very difficult to move. To resolve this, I had to remove the rubber sleeves and then grind away the corrosion, which came off as a white powder. If you're not prepared to deal with this situation, then you're probably best off taking it to a shop. 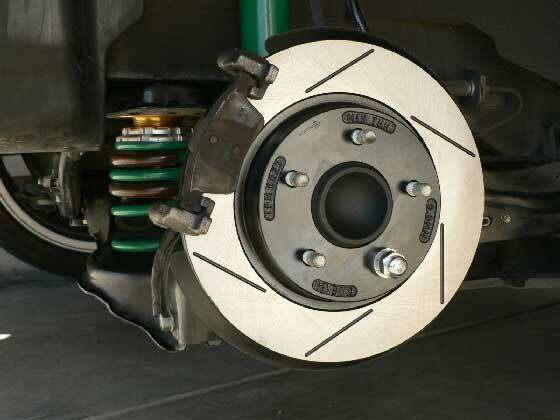 If the sliders do not move freely, you will have problems with the brakes going forward. 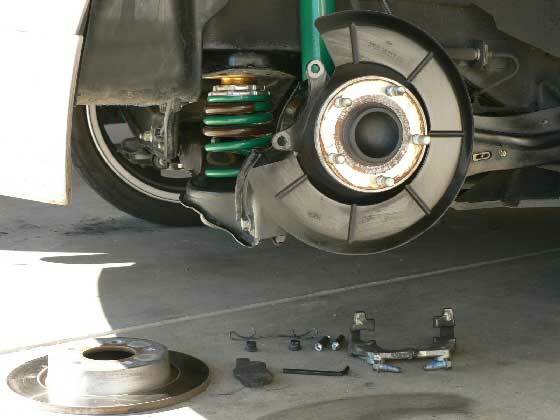 After completing the install & remounting the wheels, get into the car and press the brake pedal a few times to build up pressure, and engage and disengage the e-brake a few times. 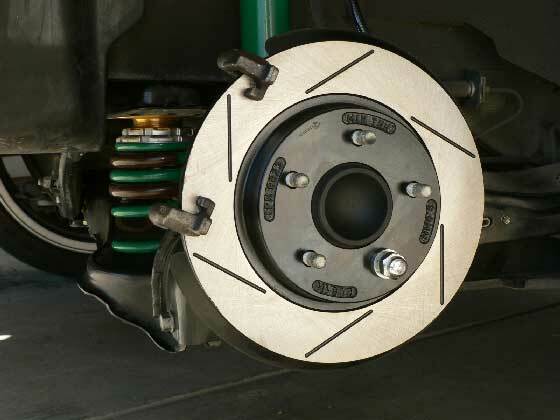 The rear brakes are self-adjusting, and it will calibrate/align the piston by the use of the e-brake.